Perry is a high school student. For the last nine months he has had an exchange student living with his family. Before she arrived he had all the typical teenage fantasies about this girl from abroad who would be arriving to stay with his family but unfortunately for him Gobi was far from the fantasy he had in mind. On her last few days in the country Perry is told by his mother he is taking Gobi to the prom. He is not happy about the idea at all as he was supposed to be playing a gig in New York and truth be told he doesn't want to be seen with the frumpy Gobi yet he is made to anyway. It's only once he gets to the prom that everything kicks off. Gobi transforms in front of his ideas to this ninja assassin who leads him on a trail of destruction across new york killing a variety of people in her wake. What I loved most about the book was Perry's reaction to the crazy situation he has found himself in. He is stunned to say the least but also has no idea about what he should be doing or how he ended up in the position he is in. The action in this book is fast paced. 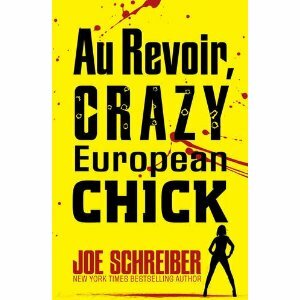 The whole book screams to me that it needs to be made into a film as it is so action packed and funny and witty throughout. I loved the contrast between Gobi and Perry and the way they interacted with each other. All in all a surprising good read which I enjoyed completely. I really enjoyed this book-like you said, it was hard to put down! I enjoyed the fast pace and twists as Perry struggles to process everything that is happening as we the reader get a quick tour of NYC.